12 April 2018 was a day of immense celebration for 17 law and justice sector leaders and mangers representing Ministry of Justice and Community Services, Department of Corrections, Customary Land Management Office, Vanuatu Cultu ral Centre, Office of the Ombudsman, Public Solicitor's Office, State Law Office, Vanuatu Law Reform Commission and the Judiciary. 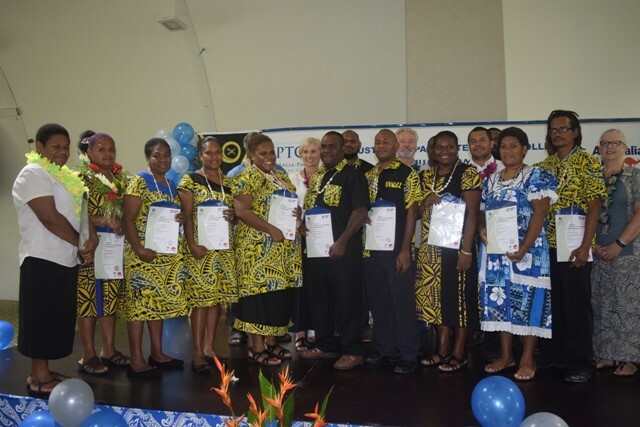 These officers were formally awarded ea Certificate IV in Leadership and Management delivered through Australia-Pacific Technical College (APTC). Acting Director General of Vanuatu's Ministry of Justice and Community Services, Mr Pacco Siri, gave the keynote speech, congratulating the graduands on their achievements and hard work in attaining an Australian qualification. A/g DG made special mention of the 52 women graduates, as well as the 17 graduating managers from the justice and community services sector. The APTC Certificate IV forms one part of the Management Development Program (MDP). The MDP, designed and funded by Stretem Rod Blong Jastis mo Sefti (SRBJS) in partnership with the MJCS, aims to engage managers in development that strengthens their practical capabilities so that they are better equipped to confidently and skillfully undertake management responsibilities, and contribute to improved agency performance. Learning will continue throughout 2018 with technical intensive workshops, led by ni-Vanuatu experts, and be complemented by ongoing Action Learning group meetings. The graduation was also a landmark occasion for the disability sector. 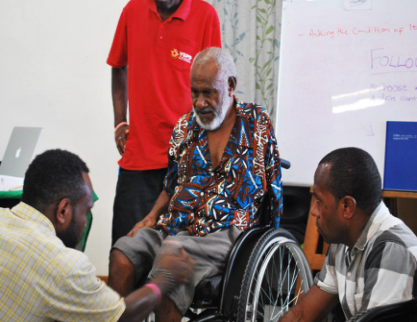 The Ministry and SRBJS celebrated the achievements of Mr Marksuel Nausien, first Vanuatu graduate in Certificate IV in Disability. On the 24th and 26th of April, the Ministry of Justice and Community Services with support from the Attorney General's Department of Australia, conducted a Policy Development training with a focus on combatting cybercrime. 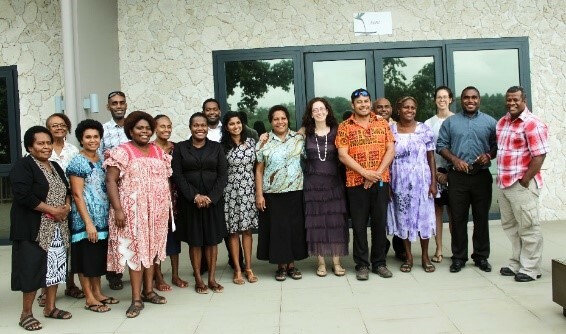 The training was attended by participants from the Ministry of Justice and Community Services, Telecommunications and Radiocommunications Regulator, Office of the Government Chief Information Officer, Foreign Affairs, VANGO, State Law, Police, Right to Information Unit, Vanuatu Law Reform Commission, Office of the Public Prosecutor, and Vanuatu Christian Council. We take this opportunity to thank the Attorney General's Department of Australia for supporting this training and Stretem Rod Blong Justis mo Sefti for its immense funding support which made this training possible. The 2 day training Policy Development training was well received and there is interests in running similar training with Police and NGOs. 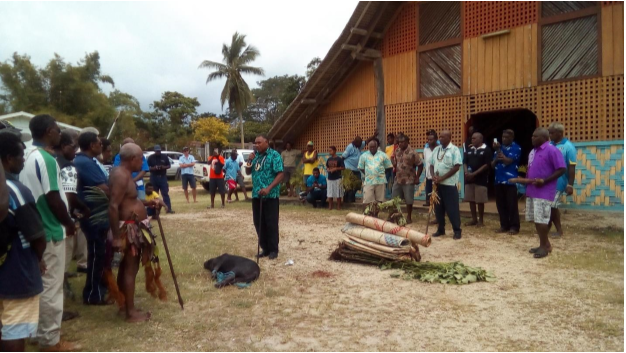 A reconciliation ceremony staged at the Chief's nakamal in Luganville on Thursday 19 April restored relationships between Ambae communities and Sanma, in particular the island of Santo. Comments on social media following the evacuation to and repatriation from Santo back to Ambae in last year's volcanic eruption have incensed communities from Santo thus calling for a formal apology from Ambae leaders. Malvatumauri President, Chief Tirsupe Senimao echoed the sentiments of the President of Sanma Council of Chiefs, Chief Levus Tamata and Sanma Provincial Council President Mr. Thomas Vora, calling for 'Respect' from guests in Sanma Province and elsewhere around the country. Speakers representing Ambae communities including Chief Andrew Mera, Honorable MP Alickson Vira, Chief John Tarilama and Chief Alicta Vuti acknowledged the immense support continuously given by Sanma Province to the people of Ambae and begged for forgiveness from Sanma leaders. Speaking on behalf of the Sanma Council of Chiefs, Chief Levus Tamata acknowledged and expressed gratitude for the reconciliation process which he stressed would restore mutual respect and pave the way for more dialogue on the issue of land for Ambae evacuees. Honourable Antoine Pikioune, Minister of Finance who also participated in the reconciliation process reiterated the Government of Vanuatu's support to finding adequate and appropriate space for Ambae evacuees. Other dignitaries who took part in this reconciliation process included CEO of Malvatumauri, Mr Tom Jean Pierre, Ms Cherol Ala, Director General of Ministry of Internal Affairs, Deputy Director of DLA, Mr Onen Gavika, Chiefs of Sanma council of Chiefs and Luganville town Council of Chiefs, church leaders, Ambae Councillor, Mr James Tarito and leaders of Ambae Disaster Committees in both Santo and Port Vila. 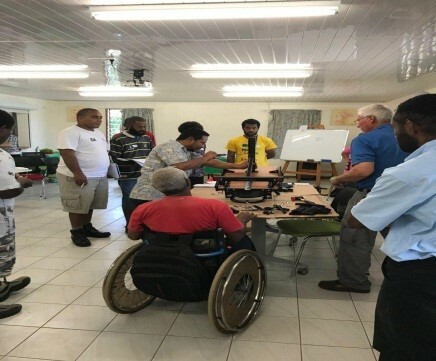 Disability Desk is very delighted to have effective working partners such as Motivational Australia and VSPD who had conducted two weeks intensive care training on Wheel Chairs on Clinical and Technical to participants coming from Fiji, Kiribati and Vanuatu. The purpose of the training is to train trainers to upskilled their knowledge on how to maintain the devices especially on wheel chairs for the disabilities within our respected communities. However, the Facilitator was coming from USA and Kiribati just to train the participants. All participants had received a certificate at the end of the two weeks training. The Ministry of Justice and Community Services in partnership with Stretem Rod Blong Jastis mo Sefti (SRBJS) seeks to encourage an environment where staff actively maintain and develop their professional knowledge, skills and expertise. To support this aim, staff from Agencies and Offices in the Justice and Community Services sector and relevant non-government organisations, may apply for financial support through the Vocational Study Support Scheme (VSSS) to cover the basic costs associated with undertaking part time vocational study. Interested applicants must complete an Individual Application for Part-Time Study. Please note that the application must be received at least 4 weeks prior to the due date for enrolment fee payments. For Semester 1 2018, applications will not be accepted after 5pm Friday 12 January 2018. Note also that the institution will have its own admission procedures that applicants need to fulfill. The application must be justified on the basis of clear links between the individual's training needs and the proposed vocational or professional education, and also requires management endorsement. Once an application is received by SRBJS, it will be assessed along with other applications as part of a competitive process and applicants will be advised promptly of the results. The complete application process is outlined in VSSS Application Procedure. 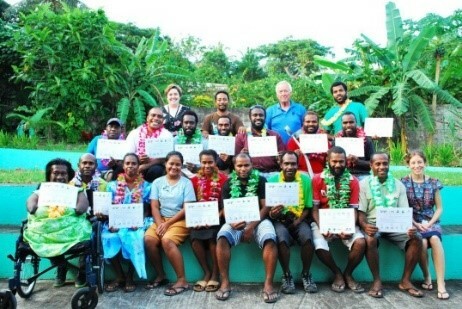 Staff from across the Justice and Community Services sector can consider this opportunity, and investigate the range of vocational and professional education offerings from Vanuatu Institute of Technology (VIT), University of the South Pacific (USP), Australia Pacific Technical College (APTC) and others.